The Low Smoke Chulha has been enabled by Philips Design in close co-operation with NGOs, self-help groups, local entrepreneurs and potential users. Low Smoke Chulha provides a safer home environment for families, reduces the risk of respiratory illness, and supports indigenous ways of cooking. 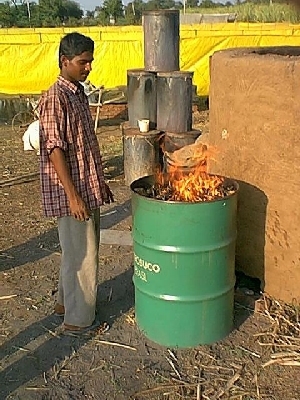 The Low Smoke Chulha is not only smokeless but also helps every household save 10 kilos of firewood each house each day which is 4 tones of firewood a year! Supports indigenous fuels and ways of cooking. 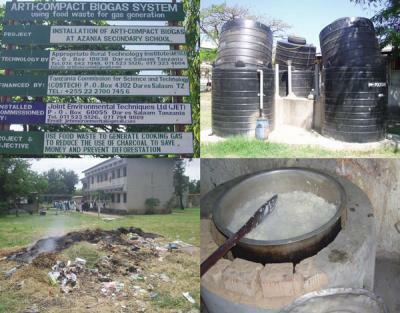 For those of you interested in the ARTI biogas system, please have a look at our new report on "Anaerobic Digestion of Canteen Waste at a Secondary School in Dar es Salaam, Tanzania". 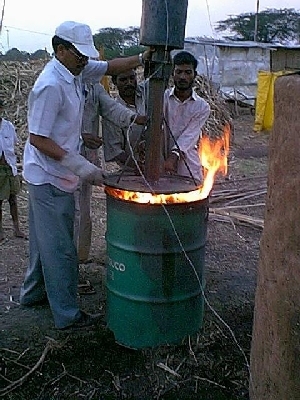 How to Build the ARTI Compact Biogas Digestor (also see the attached pdf). 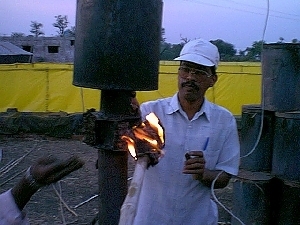 Two Days at the ARTI to demonstrate charcoal production using Top-Down pyrolysis and off-gas combustion. Pyrolysis Gas Burners) it seemed appropriate to at least try and demonstrate the concept. So after the conference I spent two quick days in Phaltan, building, modifying and trying out a oil drum charcoal maker modeled after one I built back in Canada three years ago. 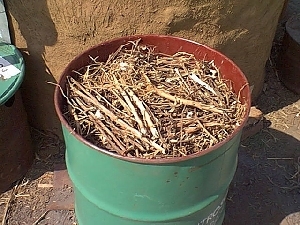 This shows the mostly full drum of cotton stalks. This trial did not work so we moved on to a denser fuel, bamboo. below. The fire on top needs to be burning over the whole surface. Then a small hole is dug in the dirt at the bottom of the drum to allow some air up through the bamboo to the fire on top. This increases the fire intensity and causes the fire to move down into the bamboo below the top. After five or ten minutes the burner can be placed on top. With the burner placed on top the flames are extinguished and the bamboo smoulders or pyrolyses. Notice the small opening in the dirt at the bottom of the drum.